Ben Foden returns from a two-week break from action to skipper Saints from the wing against Scarlets at Franklin’s Gardens on Friday night (kick-off 7.45pm). Nic Groom and Stephen Myler are also back after being rested for the recent defeats at Montpellier and Leicester Tigers. Mike Haywood replaces Charlie Clare in the No.2 shirt, while Michael Paterson is in for David Ribbans and Lewis Ludlam replaces Ben Nutley at seven. Saints are keen to get some momentum back ahead of next Friday’s crucial Aviva Premiership game at Bath. And Jim Mallinder’s men know that only a win will do if they are to progress to the Anglo-Welsh Cup semi-finals this weekend. Saints must secure victory and then hope that Leicester Tigers, who have already qualified, can beat Saracens at Allianz Park on Sunday. Meanwhile, this weekend’s opposition, Scarlets, have nothing to play for, having already been eliminated. 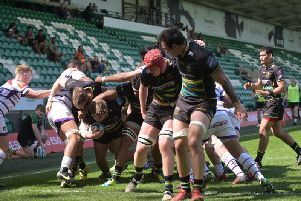 Saints: Tuala; K Pisi, Tuitavake, Mallinder, Foden (c); Myler, Groom; E Waller, Haywood, Brookes; Paterson, Day; Gibson, Ludlam, Dickinson. Replacements: Fish, A Waller, Hill, Ribbans, Craig, Dickson, Hutchinson, Estelles. Scarlets: D Jones; Williams, Smith, R Jones, Griffiths; McBryde, Lloyd; Robinson, Hughes, Gardiner; Helps, Bernardo; Phillips, S Evans, Allen (c). Replacements: Fawcett, Myhill, Sebastian, Day, Condy, Cole, Maynard, A Evans.